12 breweries from Hong Kong have withdrawn from this year’s Beertopia, the city’s biggest craft beer festival, after the event organiser raised the costs for exhibitors. A dozen breweries from the 20-member Hong Kong Brewers’ Guild, including the city’s best known craft brands such as Gweilo Beer, Young Master Ales, Moonzen Brewery, and Black Kite Brewery, have announced on Facebook that they will not participate in October’s Beertopia, a craft beer festival that started seven years ago, stating that the ethos of the event “has shifted away from its original focus on the enjoyment and promotion of craft beer”. “Beertopia has previously been one of the calendar highlights for local Hong Kong breweries – they like nothing more than sharing their beer with like-minded passionate craft beer fans. 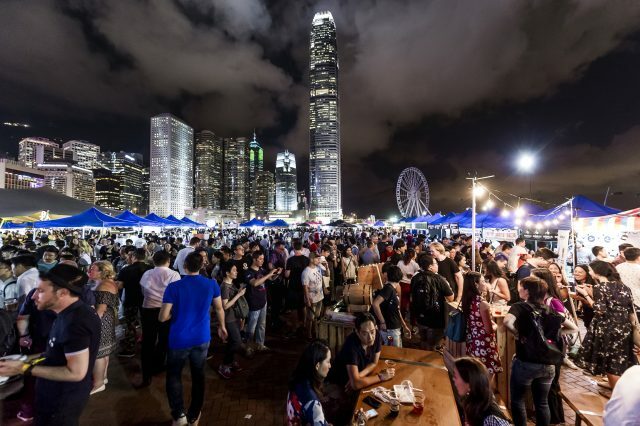 “However, the increased cost of the event to Hong Kong’s craft breweries would necessitate exceedingly high prices for end customers,” the Guild wrote on Facebook. “Collectively, the Guild feels that the ethos of Beertopia has shifted away from its original focus on the enjoyment and promotion of craft beer. Whereas large international producers can afford the newly raised event costs by serving industrial-scale beer, local Hong Kong brewers have no financially viable way to participate in Beertopia,” it continued. The event organiser Jonathan So, however, explained to SCMP that the rent for Central Harbourfront venue has risen by 50%, and in order not to pass on the price hike onto consumers, the costs are shared among participating breweries. He said last year stall rental prices ranged from HK$9,000 to HK$17,000, while this year they were HK$11,000 to HK$24,000, arguing the exhibitors might be complaining about additional costs from logistics, staff hires, and booth decorations. However, with rising costs, smaller scale breweries such as three-year-old Lion Rock Brewery, said the cost of renting a stall was a major financial concern. “Before it was around HK$20,000 to rent the booth and we would just break even or lose a little bit, but when we inquired about this year’s event, we were quoted HK$28,000 to HK$30,000 and so there was no way we would even break even,” Donald Yeung To-fung from the brewery told the newspaper. In protest, the Hong Kong Brewers’ Guild, the Craft Beer Association of Hong Kong and local breweries are working together to organise new craft beer festivals in the coming months and years ahead. Nonetheless, Beertopia will be held on 5-6 October. Jonathan are you sure your profit margin was marked up a further 50%. On the other hand, all 20 locals should be there even if subsidised.